You mean, King Khan vs nobody. Right? The sheer idea of bringing the King Khan and the Number One Khan up at the same level for comparison is, we must say, a dullard's suggestion in the first place. Let alone the degree of absolute psychosis that one would have to suffer from if he were to even try and compare them, the highly doltish idea of the Number One Khan being better than the King Khan is something that can come only out of a man without any imagination. They are cards from different decks; they might get on to one stage together someday, shake their bellies and touch each others fingers a little, but that does, in no way, make them even equivalent to each other, let alone Number One being on the advantageous side. Actually, even the thought of shaking fingers with the King might just get the Number One hyperventilating. Number One is someone who can make you laugh by just standing in front of you. He wears glittery shirts that make him look like he has just walked out of a 1980's movie, has cinema posters showing him wearing a half pant while wielding a samurai sword, wears lipstick, and is well known as a mamma's boy whose mamma takes him wherever he goes. Now, how cool is that? On the other hand, the king has taken the whole of Bollywood to a new level through his brilliance in the art of acting, has more blockbusters than Number One can dream of, and most importantly, does not walk around in glittery t-shirts that read, "I am number one," while trying to make out which gender's door to walk through inside a washroom of Sonargaon. Oh yes, did I mention that watching the intro of, "You are my love," starring Number One brings only one question to one's mind; how does he resist the urge to throw up after listening to his own voice? He sounds like a duck suffering from bird flu being choked to death in the cruellest manner possible, something that you would wish actually happens to him if you heard him. Trust me, watching him choking his words out of his mouth as if he has just swallowed a hot marshmallow and has his teeth stuck, is a true torture to any sane person. If you do question the integrity of the King's place, I believe you are insane and you have not watched Number One in action. Many words put short, these two kings just do not go at the same par, and so, it would be proving our utter and absolute lunacy if we try to weigh them against each other. Allow us to make this clear: anyone who thinks The King and Number One are comparable is a lunatic suffering from absolute psychosis and is suffering from an acute crisis of Vitamin A. How? Let me ask you, do you know who is the Nobody we are talking about? You might have seen him once or twice before, staring down at you from movie posters (illegally) pasted all over the city terming him the number one. No. One Shakib Khan. He truly is No. One, as opposed to No One. He walks a fine line between being a genius actor and a national treasure. In fact, he is a better actor than Nicholas Cage IN National Treasure. Compared to his graciousness, this Shahrukh dude is just another Indian in a sea of Indians flooding our media these days. There is no love for our country these days. Chubby aunties and their equally chubby daughters all want a piece of Shahrukh, while the loving for our one and only Shakib is left to the maids and rickshaw pullers. Not fair. I mean, what does this self-proclaimed King Khan have that our Khan can't match? I mean anyone can stack up on steroids and build a killer body only to act in lame third class romantic comedies, but it takes a real man to flaunt a flabby fat filled top on screen, like our No. One man. Shahrukh may have worked alongside beautiful women like Deepika Padukone and Katrina Kaif (did he? No idea…just putting it out there) but our Shakib Khan isn't far back either - he worked with some world kelass actresses like Shabnur and Popy. It's a shout out to all those depressed fat women out there - come to Dhaliwood and act. Body fat and general chubbiness is not only welcomed, it is the only quality they look for in a woman here. Would the snobs and high-minded directors of Bollywood (and Shahrukh's friends) ever hire any of these women? Still the fat aunties prefer Shahrukh and his band of merry Indian snobs. Moving on to the quality of films, Shahrukh's only signature move is a super lame dance move involving some simple hand motions. He occasionally cries too. In My Name IS Khan (seriously - look at the ego on this symbol of mediocrity, he even named a movie after himself!!) he plays the role of a handicapped person claiming he's not a terrorist. It was his best performance to date, mostly because it was so natural - seriously, who would be terrified of him? Seems the only angle to his acting is crying helplessly, dancing occasionally, and acting like a mentally challenged child. 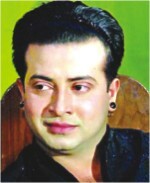 Shakib Khan, on the other hand, is a perfect example of macho-ness. Taking after his much-revered idols Sylvester Stallone and Daniel Radcliffe, he is all about the action scenes. It is often said (in hushed tones) at the offices of FDC that Shakib should never be allowed to do a love scene without an ambulance standing by, lest he hit the heroine and she dies from blunt force trauma. Other than being a blunt weapon of mass destruction (yes - masses of fat, often in heroine form), he is also a versatile dancer. He can also pull a rickshaw better than Shahrukh can (proof? Watch Main Hoon Na). All this justifies the fact that he made a movie after himself. Shakib Khan has brilliant fashion sense, while even a million bucks can't buy Shahrukh any sort of discernible traces of taste. Our Khan wears glittery shirts and muscle tees and can actually pull it off. No one would dare refute his good taste for fear of being hit. Shahrukh, on the other hand, would look like a ridiculous clown wearing anything our No. One can wear. In the end, it all comes down to womenfolk. It cannot be denied Shahrukh's crying and whimpering gets all the ladies because they think they can relieve his pain(!). Thus he is infinitely more popular than Shakib Khan, and we can't do much about that. Seriously though, pick a national figure and idolise him too, please. A prime candidate would be another Shakib. Shakib al Hasan. According to a credit card company's advertisement on TV, some things in life are supposed to be priceless - like seeing your parents metamorphose into children again albeit for a brief period of time. But thanks to the mushrooming business of reality shows, watching parents behave like children isn't a rarity these days. All you have to do is turn on the TV and wait for some reality show involving children to start. Parents take their children to reality shows because such shows are supposed to provide a stage where talented young boys and girls can showcase their talents in front of a large audience. The celebrity judges are also supposed to inspire children to perform better in the future. Besides the lucrative prize money on offer, usually for the first three positions, isn't bad either! So succumbing to the lure of fame, money and glamour, parents take their children to money spinning reality shows set up as baits by sponsors. And thus every now and then, the repugnant sight of toddlers dancing to the music of romantic songs terrorises us when we turn on the tube. However, everyone cannot be in the top 3 positions and parents should know their children aren't as good as FC Barcelona (class of 2009), i.e. they cannot be expected to win every competition they participate in. And when their children get eliminated from the show, parents are supposed to act like parents; ensuring their toddlers understand losing in one competition doesn't necessarily have to mean the end of the world. That's when it goes awry - as if a group of weeping toddlers isn't a scene pitiful enough, the parent (usually the mother) of the eliminated participant starts crying too! And that's not the only incident where parents turn into kids-during quiz competitions some parents actually try to help their children through illegal means and in the process inspire them to cheat. Such parents when caught red-handed are actually kicked out of the studio before they are able disrupt the competition once again. There are also plenty of parents who are so tensed before the results of admission exams of their ten-year-old kids that they start crying instead of soothing the pressure on their children. “To err is human” a quotable quote indeed and it applies to all human beings except the parents. That's because parents always know what is right for you. Your life can become pathetic due to their actions but don't forget it's the right decision for you in the long run. Such an infallible and unerring breed of Homo Sapiens doesn't deserve to be portrayed on television as kids. And it's about time some parents realised that!